It’s our “To Grandmother’s House You Go” Thanksgiving special. Buy three bottles, and if you live in CA, OR, WA, AZ or NV shipping is FREE via GSO. For other shipments requiring UPS Ground, it $10 (a $15 savings!). Wine Club discounts apply. See our listing of 3 Bottle Gift Packs. If you want to substitute other wines, call or email the tasting room. Note for UPS shipments, Nov. 13th is the last day to guarantee before Thanksgiving arrival. For GSO it is Nov. 20th. 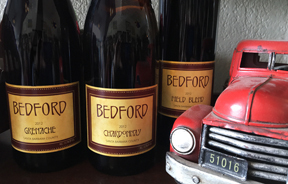 You are currently browsing the Bedford Winery blog archives for November, 2017.